It's that time again! As summer quickly evaporates, it is time to start planning your classroom layout and decor. 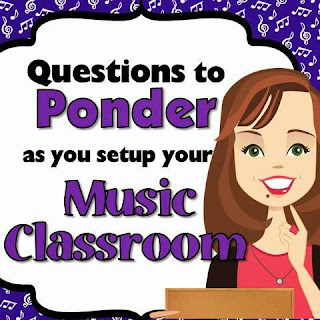 I'm linking up with Organized Chaos for Fermata Fridays to share a post about setting up your classroom. Click on over and check out the other link ups! This summer seems to have evaporated! It is hard to believe that school will be back in session in just a few weeks. I'm linking up with Aileen Miracle to chat about what we've learned this summer. As a compulsive list maker, I love challenges like this! 1. Kindness is always the right choice. My awesome husband making a new friend. For those of you keeping track at home or who follow me on Facebook, you know that this year has been a challenging one. Almost a year to this date my husband and I were in a car accident. This set off a chain of unfortunate events. I broke my left wrist and had a huge cut on my right hand. Typing was impossible and my piano skills are still more than wobbly. My hubby cracked his sternum and received unbelievable seat belt injuries. A few weeks later he had a stroke and a couple of months later had a defibrillator/pacemaker inserted. His recovery has been long, painful and exhausting. What happened during this time was an outpouring of love and kindness from friends and family, friends on Facebook we had never met and an amazing group of music teachers I collaborate with. My school family was equally as compassionate and reached out to us to help us through this time. At the end of the school year we had something incredibly hateful take place in our church. I won't go into the details, but it was hurtful to us and especially to my husband, the pastor. We had a choice. We chose kindness. It was hard, because it was not what I wanted to do, but it was the right choice. After the year that we had experienced, we knew that God was in control and that by showing kindness we were showing His work in our lives. Why share this intimate story? Kindness is always the right choice. We couldn't have known then, but choosing kindness opened up doors, forced some decisions we had been dragging our feet on and brought about a great deal of positive change in just a couple of months. So the first lesson of summer was "Be kind." 2. Take time to remember. Take time to reflect. Okay, so I'm feeling just a little sappy and this summer I've spent time remembering and reflecting. My amazing son will turn 16 this week. It seems like just yesterday I was packing his little Spiderman backpack and walking him to Kindergarten. As he prepares to start his junior year of high school, I wish I could just pause things and keeping him from growing up for just a while longer. I'm so proud of the young man that he is becoming and love looking at pictures like the one above. You know, he does a lot of this NOW too! During the school year things just seem to zoom by. Days blur into weeks and into months as we cram our schedules full of activities and obligations. Summer has been a wonderful time to remember and reflect. I've reflected over the past 20 years of teaching and how much has changed. Computers, iPads and Smartboards are essentials in the classroom, but 20 years ago I didn't have any of those things! I have reflected over the last school year and thought about what worked, what didn't and what I would do again. As always, I have a HUGE list of things I want to try next year. When I look at my yearly plan (laid out by month) I can't imagine squeezing anything else in, and yet...I've already started making centers, creating song lists and planning ways to make it happen. Remembering and reflecting are great ways to keep your teaching focused and fresh! My fearless, 3 year old daughter. She has decided that she is only wearing dresses (and has since MAY!). That doesn't stop her from saving the world. In heels. The last lesson of summer is actually one that I tell people to do ALL the time! I always say "Pick something that you love doing and then do it. Then it doesn't feel like a job. It is your passion." I say this often because I believe it completely. I love teaching music, so I do it. I love making people laugh, so I do it. I love helping kiddos find their voice, so I do it. I love eating, laughing, creating....so I do it. I've been blessed to have worked hard and found ways to do all of the things I love. Most of them I get to do every day! This summer I've had several opportunities to do things that I love, but don't get to do very often. I went on a trip to Vegas (partly for work) with girlfriends from college. I slept until almost 10:00 a.m. a couple of times. I declined some offers so that I could just be at home. I did crafts with my daughter just to get to play with a little glitter and to see her smile. I had a long talk with my son at midnight about everything and nothing. (Okay...it was just a few minutes, but for a teenage boy I think that's something!) I ran off with my hubby to see a couple of movies. With popcorn. And butter. The best lesson of summer? Take time to do what you love! Tell me, what have you loved doing this summer? A day in the life of an elementary music teacher can involve 6-10 different classes of students varying in age from 5 to 12 years old. It can involve hundreds of decisions, dozens of songs, a hand full of negotiations and more strategies for classroom management than you can shake a maraca at. I find that streamlining some of the transitions gives me more precious time with my students and eliminates just enough whining and chaos to make my days more enjoyable. 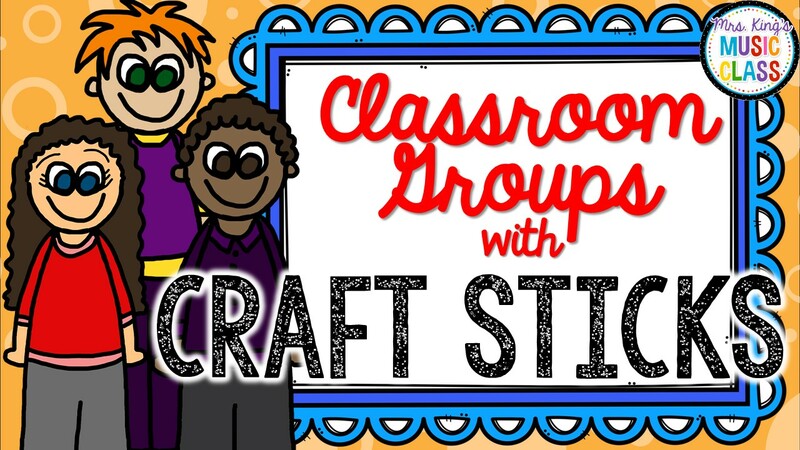 Today I’m going to share with you one of my favorite tools for assigning groups, singing parts, partners or picking someone to give me an answer – CRAFT STICKS! Many moons ago when I was but a fresh faced teaching newbie I struggled with transitions from whole group time to small group time or partner work. Just saying “pick a partner” seemed like the quickest, easiest thing to do. Yeah. I know. You are already shaking your head at my naivety, aren’t you? What happens when you say something like that? The two most popular kids are swarmed by every single kid in the class and the three quiet or eccentric kids kind of float away from the group and try to hide behind the piano or in a corner far away from Pick a Partner Land. At this point, no matter what I say the classroom just gets louder and louder. Drama Queen starts to cry. Angry Albert punches someone who doesn’t want to be his partner. Sticky Steve has touched every single person in the class with his syrupy hands that haven’t been washed since breakfast. And honestly, this would be the exact moment that my principal would pop in for a walk-through evaluation. So first I developed a classroom signal to get everyone’s attention and make the chaos just stop. I clap ta ta titi ta and they echo it back. No, it is not original, but it works. Next I pondered and prayed and thought about strategies that I could use to eliminate that chaos and wasted time. When you only have 50 minutes a week, losing 5 minutes to transition into groups is just unacceptable. I must admit that I tried several things that I really hated. I tried having them turn to the row in front of behind them to find their new partner. I sorted them by boys and girls, by the color of shirt they were wearing by the order they appeared in my room. I tried just counting them off and creating groups that way. I assigned everyone a number and a group and tried to keep track of that all year. Hated all of that. Don’t get me wrong. Some of it worked some of the time. A few of the things I tried worked every time, but I struggled with those days when I needed them to transition from a whole group to partners and then to small groups and then to 2 groups. That seems like a lot, right? I really enjoy using a variety of activities and some weeks it just worked out like that. Sitting on my couch one evening I realized that I could create ONE tool that would help me quickly divide students into groups of varying size without having to take the time to count or pre-plan. 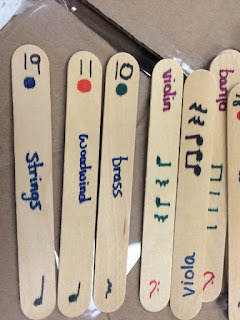 I took craft sticks (the larger flatter kind work best) and set about putting symbols, colors, rhythm patterns, instrument names and MORE on these little wooden pieces of gold. First of all, I numbered the sticks. This helped me if I wanted to take out the extra sticks for smaller classes. I made 34 sticks. My largest class was 27. I had a few back-ups just in case someone sneezed on one or stuffed it in their ear or mouth or something unacceptable. The number allowed me to divide the group into odd or even. Awesome. Hmmm. The kids caught on to my other tricks quickly so I didn’t want them to anticipate that would be the only way I would pick partners. I needed more. I added another way to divide the group in two: treble clef and bass clef. To divide the group into 3 I drew a quarter note, quarter rest of barred eighth notes at the tip of a craft stick. I did these in order. #1 was a quarter note, #2 was a quarter rest, #3 was barred eighth notes, and so on. This helped me keep things even. To divide into 4 groups I wrote the instrument families on the sticks: brass, woodwind, percussion and strings. To divide into 5 groups I added colored dot alternating 5 different colors. At this point, I still had just a little bit of space left on these wooden warriors of the classroom. I decided that adding instrument names would be my last addition. I added the names of instruments of all 4 instrument families. 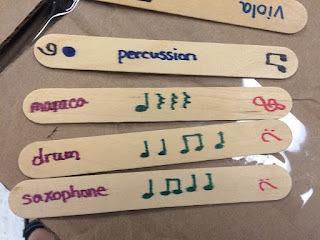 For my third graders who reviewed instrument families all second semester, this gave me lots of options for grouping, identifying instruments, sorting by family, spelling instrument names and more. I tried them out the next day. Magic! I never really used them with every class, every day, but they came in handy several times a week. Eventually students started asking for them. They liked the spontaneity and randomness they brought to class. The pictures that I have are of one of my older sets. You can see that there is just a little bit of bleeding due to the markers that I used. In my newest set (that I do not have pictures of-sorry!) I used Sharpies which bled much less. Applying a clear coat or a light coat of a light color of paint would probably prevent this completely. So by now, some of my faithful blog readers know that I love hitting the dollar stores for classroom finds. I love being able to set my ideas to reality inexpensively. It works for me! In this blog post I'll show you another one of my favorite workstations. It is quick and easy to make and can be quite versatile. For this project you'll need a dip tray. I use the rectangle kind with three compartments, but other styles and sizes will work. I usually do not choose those that are transparent because they tend to show fingerprints and dust a bit more than the others. This was the only one I had that hadn't already been used. You'll also need a black, permanent marker and some poker chips. Number your compartments with a paint pen, permanent marker or by printing out some numbers and laminating them. I will use this center with second graders after I introduce the whole note so I chose the values 1, 2 and 4. On the poker chips, draw notes or addition/subtraction problems on one side of the poker chip. There are several different kinds of poker chips that you can find at almost any discount stores. Some are VERY textured and others are not. Take a peek before you buy some to find ones that have the least textured center. These are easiest to write on. Using a permanent marker or paint pen is a great way to mark up the poker chips, but if you plan to use them frequently you'll want to consider adding a protective clear coat to them. When students use this center, they take turns pulling a chip out and deciding how many beats it is worth. They show the group the chip and say their answer. The group gives a thumbs up if they think it is correct and a thumbs down if they think it is incorrect. If the student has a correct answer, the chip goes in the dip tray. If not, the chip goes back in the pile (or bag or whatever container you want to use) and the next student takes a turn. There's not really a winner to this game. It's just another way to drill note values, but the charming sound of the chips clinking together is quite fun for students! Music Workstations- What Can You Do at a Workstation? 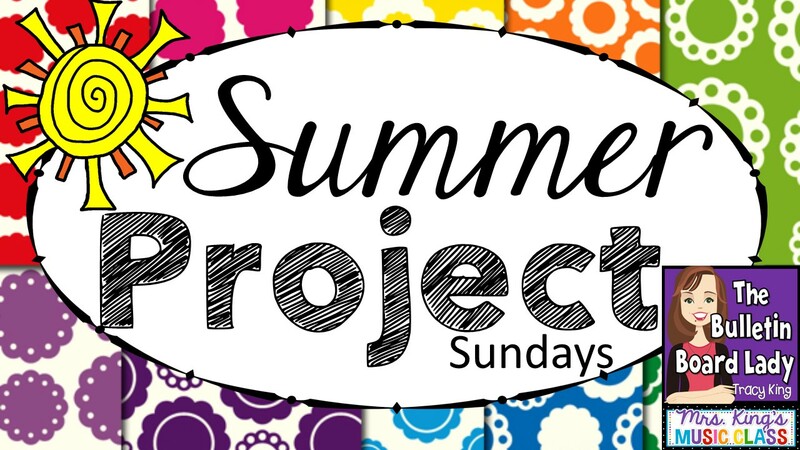 Are you working on any summer projects? Join my Summer Project Sundays linky to share your ideas with my readers. 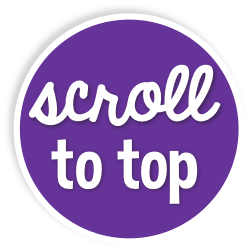 Grab the graphic below and add it to your blog post. After you've published your blog post, be sure to come back and link up. I can't wait to see what you're up to! I must ask you all to take a solemn oath of secrecy for what I am about to tell you. It's a family secret that we've kept under wraps for years. My mother is a hoarder. No, really. I could show you pictures. She has piles and piles and piles of ...well...everything! LOL. Her older sister? Hoarder. Now, this makes them a pain in the booty to move and I can never seem to find anything at my mom's house. The good news? When I need a bunch of milk jugs for a vacation Bible school project or 40-50 coffee cans for drums in my classroom they can always provide! Many years ago I found that plastic coffee cans make the best hand drums when a real instrument isn't available. I had my hoarding kin collect them for me (or dig them out or whatever). Perfect! Later I realized they were great for organizing and storing many classroom materials and were exactly the kind of container I needed to sort and organize my Boomwhackers. This week's project for Summer Project Sundays is coffee can storage. Are you working on any summer projects? Link up at the bottom of this post and share your ideas. Grab this graphic and link back to this post. 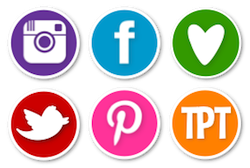 Then, add your link to the linky party at the end of this post. There are a few things that you'll need for this project. First, you'll need some plastic coffee cans. If you don't have a hoarding mom or an Aunt Marsha with 40 milk jugs in her shed, send out a note to parents. You'll be surprised how quickly you'll have exactly the number you need. I've found that parents are often willing to contribute or donate time or supplies if you just let them know. You'll also need spray paint. I don't buy any special kind. Usually I look for whatever is cheapest at Walmart. After you've sprayed your coffee cans you can add a clear glaze or not. I don't think they are lacking without it, but it does add another layer of protection against scratches. 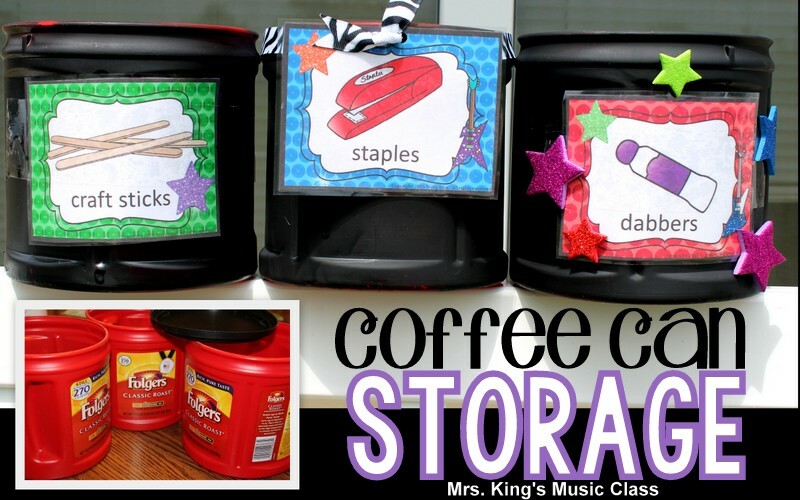 You'll need a way to attach your labels to the coffee cans. I usually print out my labels and laminate them and then use a roll of wide, clear packing tape and just tape them on. Another option is to glue your label on with Mod Podge. Keep reading to see yet another way to attach your labels. 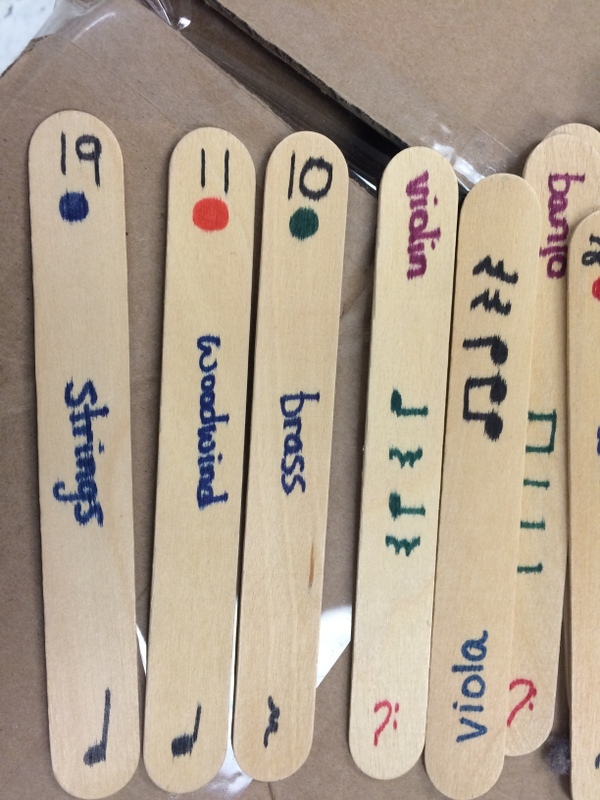 If you are a music teacher and are making a set of cans to use for Boomwhacker storage, you can download the file that I used HERE. Teachers of all subjects may want to check out my to see if there's one that would work well in your classroom. Working outside or in a well ventilated area, spray your cans withe the color of your choice. After a few experiments, I've discovered that it is best to spray from the top down to reduce runs. I'm actually doing that in the picture above (although it doesn't look like it) because I turned them open side down to dry. For this demonstration, I'm using labels from my Rock Star Supply Labels set. One of the ways that you can attach the labels to the can is tie a cute and graphic ribbon around the can and tie it off in a bow (or not as you'll see below. I am not a great bow maker.) To prep the label, laminate it and them punch two holes near the top a centimeter or so apart. Wrap the ribbon around the top of the can. There's a handy edge there. Slip the ribbon through each of the holes in the label and tie it off. Voila! This method is a little more labor intense but would definitely add a personal touch. A rock star themed classroom means lots of glitter! For this container, I attached the label with clear packing tape and then added these glittery foam stars for a little extra pizzazz. This contain has the laminated label attached with only a strip of clear packing tape. The great thing about using packing tape over the laminated label is that it is easy to remove and replace. The finished projects! This is the standard size of coffee can that I had donated. I also had a few extra large cans and several smaller cans. I've utilized the larger ones as drums, but the smaller ones are useful for organizing many things. I used the smaller ones for pencils, markers, hole punches, craft sticks and a variety of manipulatives. This picture is of one of my hole punch workstations. I tossed the hole punches and a few pencils in one of the cans and then left it at the workstation. Handy!